This post on Random Thoughts On Being An Enterpreneur got me thinking about my experiences of being an entrepreneur for over 25 years. First of all let me pick my favorite points from the post. Don’t jump in if you are not there for the long haul. If you have to choose between something that you enjoy doing vs something you have to do for money, pick the first. I saw the Google Press announcement this morning and immediately signed up. I have been using the spreadsheet in a collaborative mode for a while and did not hesitate too much to spend the $50 per year. It was a small investment for trying out a service. I have been using Google tools for such a long time for free and they are of such high quality, I felt I owed the company some money. I was glad to do my little contribution. After a few months of trial I will bring other people in my tiny organization to use this service. I don’t consider these products comparable to Microsoft Office Products. They do not have the same power or even the same ease of use of desktop apps. But for 80% of what I do with docs and spreadsheets, these are more than adquate. For more ideas, here are my two earlier blogs – one on using Microsoft Word as a blogging tool and another on my wish list for Google Spreadsheet. This morning, I saw Jon’s blog entry on Blogging Using Word 2007, and my jaw dropped. I do not believe in coincidences. But this is uncanny. I was jotting down some points on my flight from San Jose to Hartford, CT, yesterday. Since I was not online, and I wanted to blog, I thought I would type it into Word and do a cut and paste later. This got me thinking about a few ideas and I noted down in my Idea-log (a moin-moin desktop wiki). I have reproduced a fragment of my idea-log here. Look at the last entry. And here is the page on the Word plug-in. At that time, I was not thinking specifically of Word 2007. I am so glad Jon is on to this. I look forward to some interesting developments in this space. This is a dictionary of algorithms, algorithmic techniques, data structures, archetypal problems, and related definitions. Algorithms include common functions, such as Ackermann’s function. Problems include traveling salesman and Byzantine generals. Some entries have links to implementations and more information. Index pages list entries by area and by type. The two-level index has a total download 1/20 as big as this page. This is an invaluable resource to any one programming. I am glad that there is one place we can go to, to get this information. Understanding your audience is the key to success in any business – including blogging. Lately the Read/WriteWeb authors have been discussing what it is that keeps readers coming back here. Our recent poll indicated that most of you come back to this blog for Analysis and Reviews. I found the next few links from this blog. It is fascinating to watch what people read on your blog too. I wish the blogging packages do a better job of providing this info. You can do some Google Analytics magic to do this yourself. Yes, something like an “American Idol” for the technorati may be coming to Silicon Valley. I am a fan of both American Idol and American Inventor. This one has great promise. There is something invigorating about watching creative minds at work. Even the ones that do not win, inspire me. You may feel relatively satisfied with the current search offerings of Google, Yahoo, Ask and MSN. Search today is undoubtedly much better than what it was in the second half of the 1990’s. But Internet search is still in its infancy and there’s much room for improvement. Moreover, the super high valuation of Google on NASDAQ pushes investors and researchers to find better search solutions – to be The Next Big Thing. And these wannabes are not only working on discovering better indexing techniques, they’re exploring new horizons like vertical engines, meaning-based search, intent-driven search, new clustering methods, and much more. In this post, we look into latest trends in the search industry. Chris is giving a talk in AjaxWorld 2007 titled Streamlining Your Web 2.0 Solutions with XML. While JSON is replacing the client side XML to some extent, Web 2.0 applications still heavily rely on XML. I was browsing through Yahoo Developer Network yesterday. I have not done this in a while. What led me to YDN? I do not recall seeing that before (might not have noticed it) and went to investigate. Yahoo has all these cool plug-ins to scribble, co-browse etc. Some of their are third party plug-ins. The moment I saw “third party”, I decided there must be a developers kit some where for plug-ins. That took a bit more of exploration and that is how I stumbled on Krugle. I have used Krugle before and liked it. I found the messenger plug-in sdk, finally. This makes sense. Krugle has a great code search engine. Yahoo has some great Web developers tools. They can probably extend Krugle to use Yahoo Pipes too. I use Google Spreadsheet more as a collaborative database than as a spreadsheet. I looked at Google Base. But it does not have the same level of collaborative features as Google Spreadsheet. It was an amazing experience to have people across continents updating data simultaneously in real time. Here are some of the things we used it for. 2. I use it as a task list, to track activities on a project. We have this common list of tasks, three of us in three very different places update it with new items, status updates and we have one place to look for information. 3. We use it as a product idea list. We simply divide them into features, design, coding, libraries, testing and put them in one sheet each. Again a common list shared across multiple people. 4. We recently had a reunion. We used it to update who is attending, when they are arriving, any accommodation needs, food preferences etc. About 30+ people had access to the same spreadsheet for updating their one line entry. 5. Finally I am also using it as a way to gather a list of companies, products, people in XML space. My colleague in India updates the spreadsheet based on Google/Yahoo alerts of XML news and I simply add tags and description. I think the row/column format is great for managing small lists of data. We can add new attributes, sort data in different columns for viewing, etc. An automatic mechanism to high light changes since you last visited. This will allow me to come in and with one quick glance see what has changed. Ability to enter hyperlinks in the cell. Wiki style links and regular URLs would be cool. This will allow me to link to other sheets and external sites. A filtered view (where I can specify filters and the view reflects only the rows and columns that match the criteria) and the ability to share the filtered view with others (viewers only). Ability to have a rich text format in cells. Some wikiness in cell editing would be an added advantage. Google Spreadsheet as a front end to Google Base. There is nothing special about this request. Excel does this fairly elegantly. 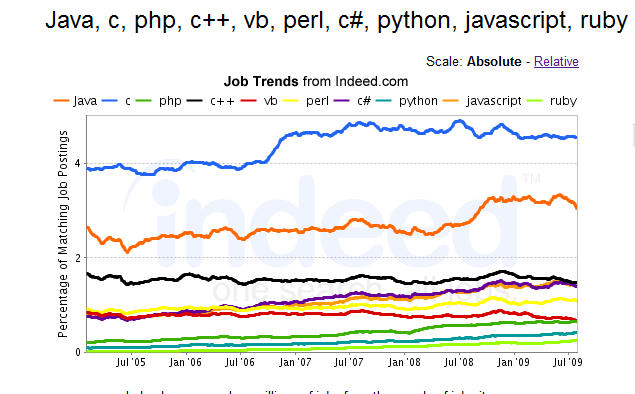 Here are programming language trends from very different sources. 1. 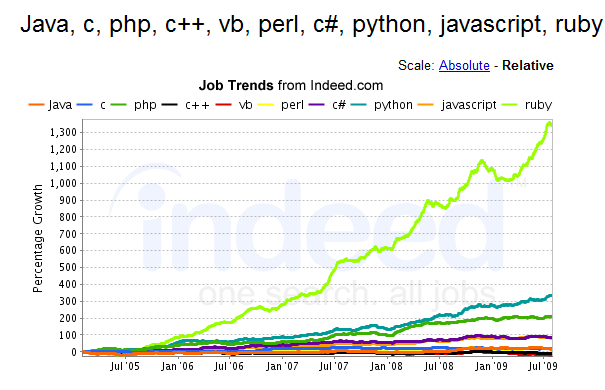 According to TIOBE Programming Community Index, here are the top 10 programming languages. TIOBE Programming Community index page, shows the trends of increasing/decreasing popularity as well and contains lots of other useful information. This changes every month so please make sure to check the latest. 2. This programming language usage index shows information about languages used in open source projects. It has a slightly different story to tell. Obviously VB is not the most popular for open source software. 3. The SkillMarket provides a tech hiring patterns. Probably tracking the searches at major book sellers, publishers may provide more useful information as well. Here is one of the most innovative efforts at interacting with users by Meebo – with their popup predicament. You can see the responses (more than 100 when I looked). I came across this link in del.icio.us. It may be interesting to see such stats in different regions in the world. I am not sure where the base data comes from and wonder what we can do to move people from the left to the right.